Many more German women survived the war in freedom than men. That’s not to say women in the German armed forces and civilians came out without a scratch. The casualties from the bombing war were high, and women were interned in allied prisoner of war camps, a fact not widely known. The women faced a shortage of men right after the war. How big a shortage? In the Soviet Zone in 1945, there were 297 women for every 100 men between age 18-30. All over Germany, the most intensive incarceration of men happened right after the war, so it was no surprise the numbers were particularly bad. And that generation, the generation of men in their 20s, always pays a high price in war. A couple of years later in the British Zone, the numbers look a bit better. In 1939, the year the war broke out, 33% of the German population was men between age 21 and 42. In 1947, it was 25%. In real numbers, there were 2 million more women than men in the British Zone. By the end of 1947, most of the prisoners of war held by the British and Americans had been freed. The Soviets held millions of prisoners until well into the 1950s. So women had to make do without men, as they’d done for most of the war. They worked in reconstruction, in factories, and in other work traditionally reserved for men. On the personal front, the postwar years saw a dramatic rise in divorces. Despite the man shortage, women and men walked away from quick wartime marriages, or marriages that had broken apart during the war. For women, the Allied armies offered opportunity for a new start. They might become an Ami-liebchen or strike up a relationship with other allied soldiers out of love, a survival instinct, or both. In the immediate postwar years, the German men who were available seemed to have had loose relationships with German women in a kind of unspoken arrangement. 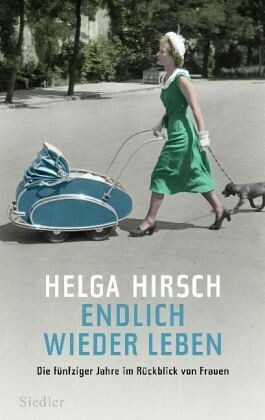 The journalist Helga Hirsch’s book “Endlich wieder leben” portrays nine German women and their experiences from war to Wirtschaftswunder. One quotes her mother: “There aren’t enough men…and those that came back belong to us all.” It’d be a mistake to think of these relationships only in sexual terms. Postwar Germany had a shortage of just about everything, and the relationships women built tended to be practical. A man could help to repair a house or get rationed goods. That was likely more important to her than the prestige of having a man at a time when there were so few to go around. I’m not a subscriber, but thanks for the tip, Mark! Thank you for this! I’d love to see this book translated. The title means: “To Finally Live Again” by the way.